This summary was born out of a question on Twitter and percolated to FriendFeed, which was “Who is using RDF and integrating other resources at the minute and what are those resources? From this question, several resources were highlighted. UniProt. The comprehensive resource of protein information is available as an RDF distribution and each Protein record has a corresponding RDF download option. Phil pointed out Semantic Systems Biology, As systems biology is largely concerned with representing networks and interactions at a systems level, a language like RDF would seem an obvious choice to represent this type of knowledge, to aid semantic description and data integration. Melanie pointed out the following resources such as Bio2RDF. This project aims to RDF-ize numerous public life-science resources using what they call a three step approach which they have developed. The following image illustrates some of the resources that are included in Bio2RDF. The NeuroCommons project seeks to make all scientific research materials – research articles, annotations, data, physical materials – as available and as usable as they can be. As a result they have an RDF triple store which they encourage you to either contribute to or download and use. 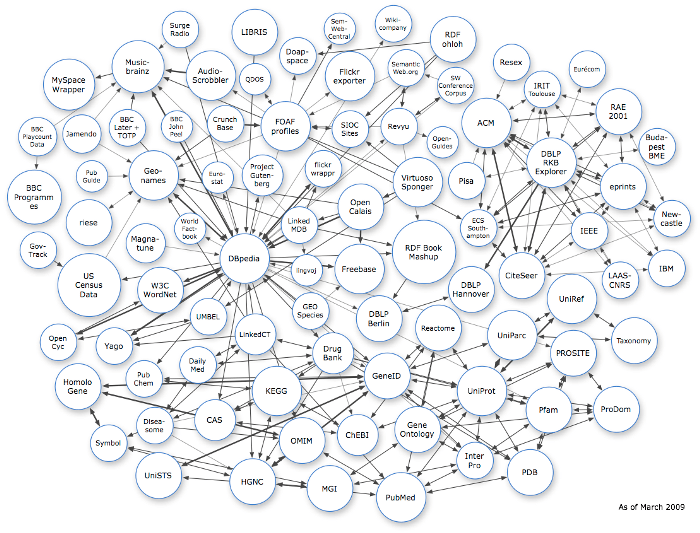 For a more general overview of resources that exist as an RDF implementation, the Linked Open Data cloud provides a graphical summary of the resources that exists and the relationships between them. If you know of any more life-science resources or projects using RDF, then please do comment below. Egon has indicated he is working on RDF-ing the NMRShiftDB and ChEMBL’s Starlight, and Andrew Clegg is considering a project proposal involving RDF. As a result a very interesting discussion ensued on FF. This entry was posted on April 25, 2009, 8:45 am and is filed under bioinformatics, life-science, semantic web. You can follow any responses to this entry through RSS 2.0. You can leave a response, or trackback from your own site. Take a look also at MIRIAM: where systems biology meets RDF. Try MIRIAM: systems biology models meet RDF. Biodiversity informatics has been playing with RDF since about 2005, coinciding with interest in LSIDs (e.g., https://journals.ku.edu/index.php/jbi/article/view/25). TDWG has developed some detailed RDF vocabularies (http://wiki.tdwg.org/twiki/bin/view/TAG/LsidVocs), and these are being used by several LSID services (e.g., http://bioguid.info/lsid.php?lsid=urn:lsid:ipni.org:names:138762-3). @ChemSpiderMan, the diagram is produced by the Bio2RDF people, so I would suggest contacting them. I would also suggest you contact Neurocommons if you want to be included in their distribution. As far as the linked data cloud goes, I dont know much about that, but probably worth contacting them directly as well. @Neil Swainston, Is MIRIAM actually in RDF? I cant see any references to that effect. @Rod Page, thanks Rod, I wonder if the Biodiversity informatics can lay claim to the first life-science domain to use RDF…..? Well, MIRIAM-compliant SBML models are annotated with a subset of RDF. See the above link and have a glance at some of the models in the biomodels database (e.g. http://www.ebi.ac.uk/biomodels/models-main/publ/BIOMD0000000001.xml). My own interest in RDF was sparked by LSIDs, which date back to 2003 (see http://www.bio-itworld.com/archive/011204/lsid.html and http://www.ibm.com/developerworks/webservices/library/os-lsid2/). The BioMoby project was looking at RDF in 2004 (see http://lists.w3.org/Archives/Public/public-swls-ws/2004Sep/att-0036/smoby-w3c-sw-ls.pdf). I think LSIDs were pushed by I3C (http://www.i3c.org, now defunct? ), so pharma and genomics probably deserve credit for being the first life-science domain to use RDF. I will add few more things, CellML group introduced their RDF Metadata proposal long back in 2001(18 May 2001, http://www.cellml.org/specifications/metadata/archive/metadata/20010518/cellml_metadata_specification.html), even initial SBML metadata specification was based on the same but later they moved to . I wrote a article mentioning how XML-HDF and RDF trinity can make an excellent framework http://www.abhishek-tiwari.com/2009/03/biohdf-xml-rdf-triplet.html you may have look on that. @ChemSpiderMan : The Bio2RDF cloud was originally based around biological sciences but we have nothing against expanding to chemical databases, particularly if they are interlinked with other databases. The main chemical namespaces we have are chebi and pubchem. Chebi has a lot of interlinks, so for some namespaces the only information that we have available in Bio2RDF are from backlinks to chebi. An example could be the backlinks to bellstein, cas, drugbank, pubchem and sabio-rk from http://qut.bio2rdf.org/chebi:15544 which are all resolvable, but some only with references back to chebi identifiers. See http://qut.bio2rdf.org/provider:chebireverseconstruct for a short list of namespaces which are only available as backlinks to chebi so far. The rest of that configuration file might also be interesting as it is more up to date than the cloud diagrams above. You can email bio2rdf@googlegroups.com if you want to suggest some more databases. why are you looking for specifically and only for RDF usage and implementations? Semantic web technologies—and their usage in the life sciences—constitute more than only RDF-izing legacy and new data. Put differently, casting the scope wider by making a list of all the projects that go under the banner “SW implementation projects with applications in the life sciences” might yield more interesting results.